This eight ton steel I-beam is six inches thick. It was selected to be preserved for future generations for the near perfect horseshoe bend ... it bent without almost a single crack in it. It takes thousands of degrees to bend steel like this. 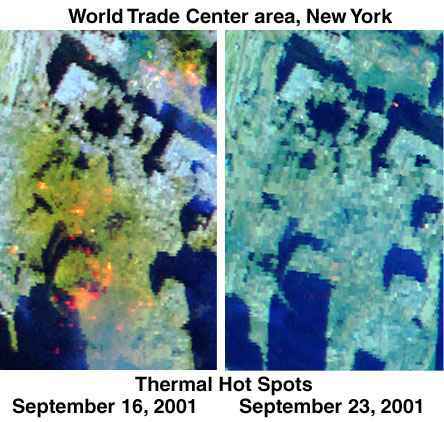 Thermal hot spots with temperatures in excess of 700°C existed in the World Trade Center wreckage for months after the collapses. "This is how it's been since day one...and this is six weeks later. As we get closer to the center of this it gets hotter and hotter - it's probably 1500 degrees." "Out on the rubble it's still, I believe, 1,100 degrees. The guys boots just melt within a few hours." What caused the steel to melt? How did it stay molten for months after the collapses? One of the more unusual artefacts to emerge from the rubble is this rock-like object which has come to be known as "the meteorite". "This is a fused element of molten steel and concrete all fused by the heat into one single element." Conventional fires cannot account for the above, but thermite can. A thermite reaction generates extraordinarily high temperatures (>2500° C) and provides a credible explanation for the fires, hot spots and molten steel (a by-product of the thermite reaction) found in the collapsed buildings. 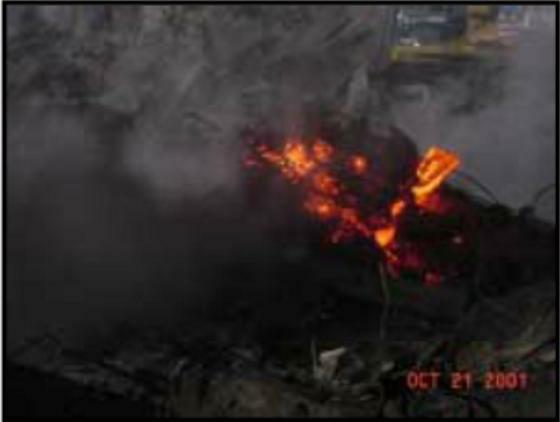 Seeming molten material recorded by Alan Chin (left), in contrast with apparent flaming debris (right), both recorded at Ground Zero on September 11, 2001. The documentary "9/11 Science & Conspiracy" by National Geographic contends thermite could not have contributed to the the collapse of the towers, but the following video demonstrates it could have easily been achieved with the correct setup. 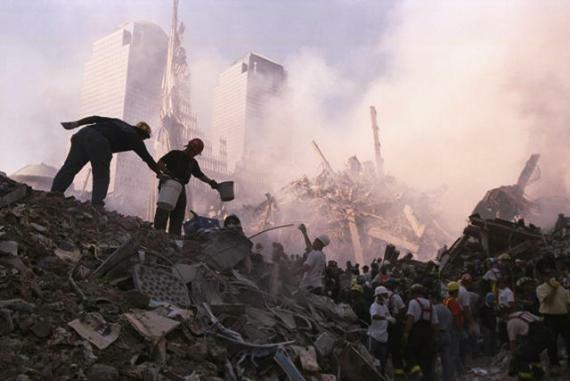 "Anyone who has ever watched a building being demolished on purpose knows that if you're going to do this you have to get at the under-infrastructure of the building to bring it down"
Peter Jennings, ABC News 9/11/2001. 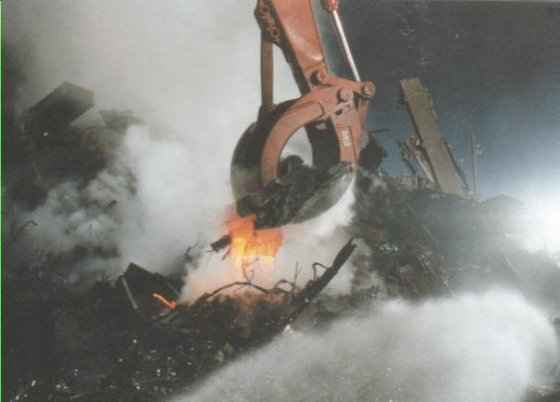 "If I were to bring the towers down, I would put explosives in the basement to get the weight of the building to help collapse the structure"
The core of WTC 1 failed below the third floor, and explosions and dense white smoke was documented at the towers' base prior to the collapse of both WTC 2 and WTC 1. Thermite gives off dense white smoke with very little odor. 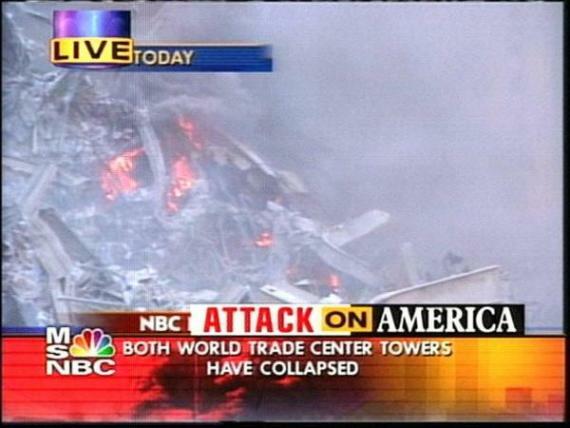 Video of smoke rising from the World Trade Center wreckage. The smoke rising from the wreckage should have been black, not white. 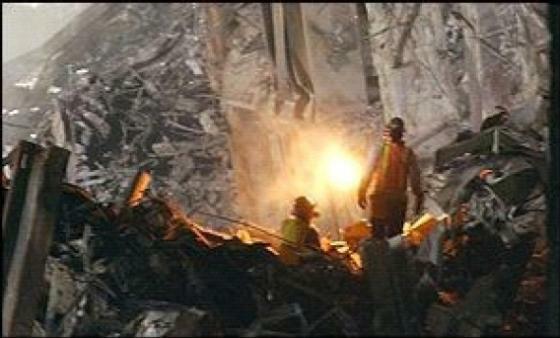 High energy ultraviolet radiation was present in the WTC wreckage. This should not have been there. 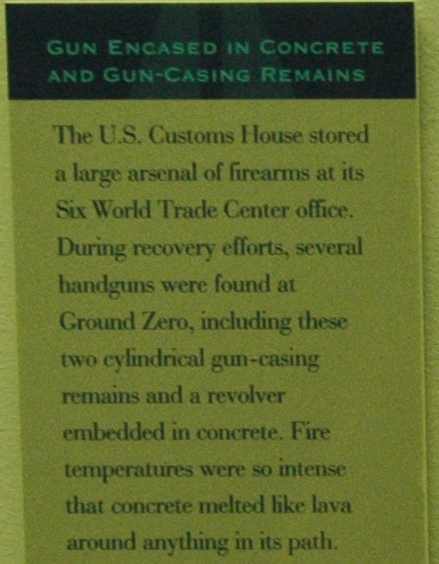 All of the above facts point to thermite being a major contributor in the collapses at the World Trade Center.